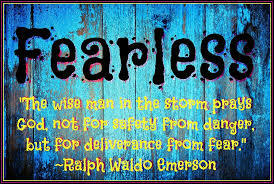 What would you do if you were truly fearless? I’ve never been much of a goal setter. I am incredibly thankful for the personal or business achievements in my life to date, but it kind of all happened ‘by accident.’ I was too young to know better (hello, 25 years old, and my first client was a multinational offering a monthly budget that I had earnt as a journalist in six). I somehow then accrued the business skills to sail through the subsequent years, build up a good sized PR agency, generate profits and employ people. Then, after my spiritual Christian explosion last year (the whole hound of heaven, G,J and the Holy Ghostwriter, getting dunked experience), everything came into sharp focus. This is not about me. Yet I have a part to play. It’s a decidedly liberating feeling to humbly acknowledge God and Jesus have the reigns, while honouring the words: Ask and you shall receive. What would you do if you were fearless? No-one is fearless. Our fears are vines that twist around our legs as we attempt to step forward. They are the whispering voices in our heads that undermine our hopes and dreams. Yet think for a moment. Do you fear the ‘thing’ you are scared over? Or is it actually the feeling of fear that has power? Example: I never set goals in my first business for over a decade because, well, what if I didn’t achieve them? What would that failure say about me? I did OK without them, after all. Setting goals isn’t scary. It was my fear around having those goals on show for all to see and not reaching them that paralysed me. Cleverly helped by my excuse that I did OK without them anyway (ahem, my dear Psych Nemesis would probably call that denial). Yet, it is a waste of God-gifted talents not to set big, hairy audacious goals and dare greatly to achieve them. Each of you should use whatever gift you have received to serve others, as faithful stewards of God’s grace in its various forms. 1 Peter 4:10. So I am currently referring to G,J & HS as the divine business management team (DBMT) because without my faith in them I’d not be dreaming so big, and daring as greatly as I am this year and beyond. I have goals. Big ones. They are daunting and – because God has a sense of humour wiring my brain for warp speed – on a rigorous five-year schedule. I have a business coach to keep me accountable. It is out for all to see. I am the business chick stripped bare. Yet, stripped down, I feel unencumbered. Able to fly. Paradoxically, given I have more on my ‘to do’ list than ever before in 15+ years of business ownership. I have a lightness that comes from faith that my true CEO has it under control: Now to him who is able to do immeasurably more than all we ask or imagine, according to his power that is at work within us – Ephesians 3:20. Nothing like a dose of perspective. It shoved down the jitters sufficiently for me to step out of my comfort zone and look at the next vista. Which is the true comfort of faith. With it, I can dare greatly. As the song goes: I am brave when I am on your shoulders. You raise me up to more than I can be. ← 2015: My Year Of Living Vulnerably – No bluffing!